On 26th December 2013, a convoy of humanitarian aid workers crossed into war-torn Syria to deliver supplies and offer help to ease the plight of innocent civilians caught up in the violence of a brutal regime. 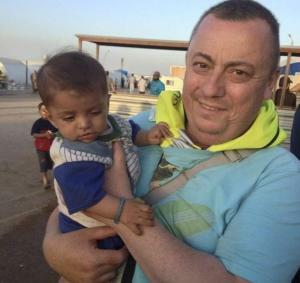 Alan Henning, a taxi driver from Salford was amongst that convoy. When a friend asked about the dangers he faced, Alan could only think about the suffering of the children of Syria that had clearly touched him deeply. Within an hour of crossing the Syrian border, the convoy was ambushed by Islamic State militants and Alan was separated from his friends. Guilty of nothing more than of having compassion for his fellow man, he was brutally murdered leaving behind his devastated wife Barbara, and their two children Lucy and Adam. This heinous crime has shocked and angered the whole world. The condemnation of these actions has been universal and resounding. Even those sympathetic to the cause this group of barbarians claim to represent have stood up to in disgust. Islamic State have fought to spread their vile rhetoric of religious intolerance, hatred and fear but what they have achieved is the exact opposite as Muslims, Christians, Jews, Buddhists, Sikhs and atheists have all come together in hope, in compassion, in friendship and in a unified sense of grief to support a man that stood for everything good about humankind. I simply cannot imagine the pain his family have been going through this last year but I hope it is of some small consolation that Alan’s legacy will be one of hope, peace and love. In a world of darkness Alan was a beacon of light. That light must not be allowed to be extinguished. Alan died trying to help the children of Syria and therefore I can think of no better tribute to him than to donate to Save The Children’s Syria Crisis Appeal. I have made a donation and I urge others to do the same. If you also wish to remember Alan in this way, you can do so here. Rest In Peace Gadget, you will never be forgotten!